With the third opening of the exclusive HYPOXI-Studio at the Modern Elahyue Complex in Teheran HYPOXI Iran continues with the next step of a well prepared and planned market expansion. 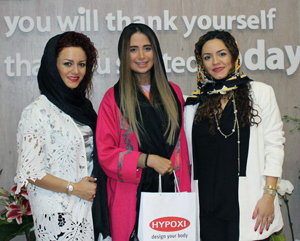 “Finally, upon strong request from our satisfied and happy clients in our 2 existing locations, we have opened our third HYPOXI-Studio in a luxurious area in Tehran at the Modern Elahyue Complex” says Mrs. Golnar Mohsenzadeh, General Manager of HYPOXI Iran. The opening attracted many guests from the beauty, nutrition and media scene and the uniqueness of the HYPOXI-Method combined with its great success in body shaping was highly appreciated. Further expansion in Teheran is the logical step to fulfil the growing demand for the HYPOXI brand in Iran and more HYPOXI-Studios are going to be opened soon.